The first convoy of Australian and New Zealand troops left Albany in Western Australia on 1 November 1914. They disembarked in Egypt on 3 December and began training at Mena Camp, 10 miles from Cairo. On 21 December Major General Sir William Birdwood took over command of the Australian and New Zealand troops in Egypt, who were renamed the Australian and New Zealand Army Corps or ANZACs. Early in the morning of 25 April 1915 ANZAC troops began to land at Anzac Cove on the Gallipoli Peninsula in Turkey. The small beach was surrounded by steep cliffs held by the Turkish forces. For more details of the Gallipoli landing visit The Battle of the Landing, 25 April – 3 May 1915. The first casualty lists and accounts of the landing reached Australian newspapers in early May 1915; the official British report was not published until August 1915. By the time the failed campaign ended with the withdrawal of ANZAC troops from 19-20 December 1915, Australia had suffered 17, 924 casualties and 8,709 deaths. Gallipoli battlegrounds such as Lone Pine and the Nek quickly became familiar to households back home in Australia. The Anzac spirit, based around ideals of courage, endurance, mateship and humour, had been born. State Archives NSW holds a number of records relating to the Gallipoli campaign. These can usually be found amongst correspondence records, but also within departmental reports, probate packets, and even in photographic record series. For example, within letters received by the Premier’s Department are two reports published by the London Gazette in 1915 on the Gallipoli landing and campaign (also printed in Parliamentary Papers). The first report was by General Ian Hamilton, Commander of the Mediterranean Expeditionary Force, and the second was by Vice Admiral John M de Robeck, the Commander of the Allied naval force in the Dardanelles. Some New South Welshmen who died at Gallipoli have probate packet records relating to their estate. Sometimes there are personal items including copies of letters sent home to family, which provide insight into the experiences of Australians during the campaign. Read some examples on our Voices from Gallipoli page. 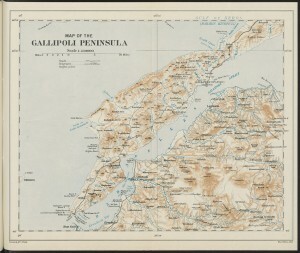 Map of Anzac Position, Gallipoli, 11 December 1915. From NRS 12060 [9-4716 letter 16-1737]. In September 1915, Premier Holman received a draft copy of a document titled ‘How Australians Fight: Changes in Military Training’. It was written and illustrated by Corporal Chaplain James Green (1864-1948), apparently as he left Gallipoli on 30 June 1915 to return to Egypt. Green included descriptions of the tactics of ANZAC forces, as well as learnings which he recommended being applied by Australian troops on the Western Front. The feat of arms which was achieved on the rocky beach and scrub-grown cliffs of the Gallipoli Peninsula …. As the open boats, under a hail from hidden guns, poured out their men in thousands on the beach …. It was mainly the achievement of men from sheep stations in the Australian Bush. Australian War Memorial, Statistics, military, accessed on 14 April 2015.